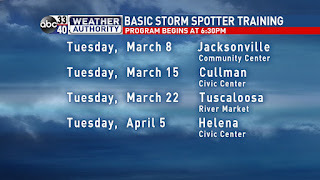 ABC 33/40 and The Weather Authority are offering five, free storm spotter training classes this spring in an effort to make the warning process better with the addition of more well-trained spotters. There is absolutely no cost, and you will never look at a storm the same again. Older kids love it as well. 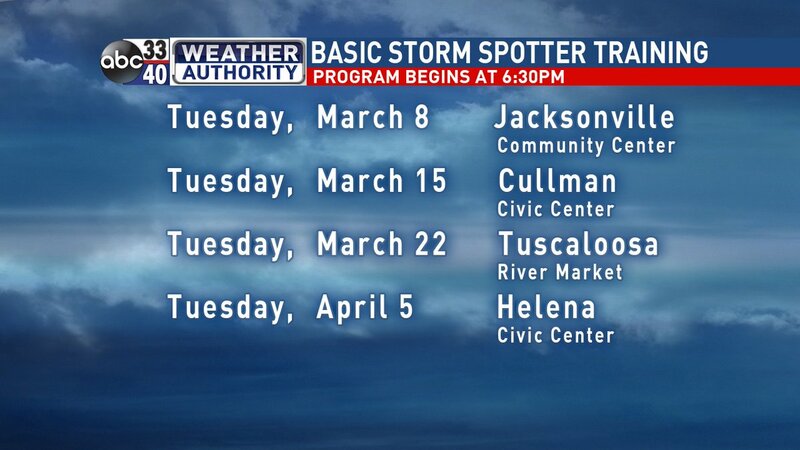 We will teach the basic storm spotter class at the first four sessions, all of which will begin at 6:30 p.m. CST. Check out the full schedule of classes and locations below. *This will consist of both the basic spotter class and an advanced class. Those that attend both sessions will get free admission to the Alabama International Auto Show. Storm Alert Xtreme will begin at 9 p.m.